Jeff Todd was chairman of Mount Vernon Lee Chamber of Commerce from 2009-2010 and served on the Board of Directors, He was a successful businessman and a friend to all he met with a special interest in successful schools and students. 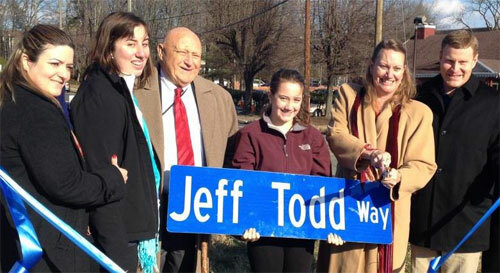 Jeff was president of Todd Family Restaurants which owned and operated three Roy Rogers Restaurants in the area. Jeff had a passion for helping people and the ability to understand community needs. Jeff Todd Way connects Mount Vernon District to Lee District just as Jeff worked to connect people and communities. It is a fitting memorial to his life. Prominent Mount Vernon businessman, philanthropist and community leader Jeffrey M. Todd died just after midnight Sunday morning in a car accident in Currituck County, N.C., 40.3 miles north of Kitty Hawk, according to North Carolina State Police. The area is near beaches popular during the summer. A passenger in the car, Jeff Todd was traveling southbound on North Carolina State Highway 168. The driver swerved to avoid hitting another car. The car then left the roadway and flipped over in a cornfield. Todd was ejected from the vehicle, state police said. Alcohol was not a factor in the accident, police said. Information about any other injuries was not readily available. Todd leaves behind his family: Wife Becky, teenage daughter Kimberly and Hannah, a student at Washington Mill Elementary School. Todd also had a brother, James, of Dumfries and a sister, Judi Todd Darnell of Alexandria. Todd had recently served as chairman of the Mount Vernon-Lee Chamber of Commerce and served on the board of several non-profit organizations. The recipient of the 2010 Chamber Citizen Award, Todd was honored in December at the Mount Vernon-Lee Chamber of Commerce Holiday Business Awards Celebration. Todd was head of Todd Restaurants, Inc., a franchisee of three local Roy Rogers Family Restaurants in the Mount Vernon and Lee areas, with locations in Belle View, Manchester Lakes and Woodlawn. The company was started by his father Jim Todd, a longtime executive with Marriott, who died last August. Jeff Todd said in an interview with Patch in December that it was the most matter-of-fact thing in the world to give back to the community that gave so much to his family. "The community has supported us over the last 24-and-a-half years and we just think it is our civic duty to support the community back," Todd said at the time. Todd said as a kid, he was a "restaurant brat," meaning he and his family moved a lot to accommodate his father's job with Marriott. After graduating from high school in Williamsburg, he studied at the University of Connecticut. While he may have sampled a lot of different cities and regions growing up, Todd made Northern Virginia his home for the last 25 years. Todd was chairman of the Mount Vernon-Lee Chamber of Commerce and served on the board of several non-profit organizations including the Mount Vernon-Lee Education Partnership, Good Shepherd Housing and Family Services and United Community Ministries.